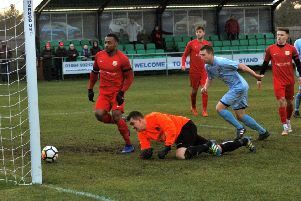 Holwell Sports enhanced their survival hopes as they powered to their biggest win of the season against top-seven side Harrowby on Saturday. Much of the talk at Welby Road before kick-off was of former Premier League striker Marlon Harewood in the Harrowby starting XI, but it was the hosts who stole the headlines with a thumping 6-1 win. The result lifted Holwell above Long Buckby into 16th, and level on points with St Andrew’s, while extending the gap to the bottom three to five points. But Neil Miller warned against any complacency with five games of the season still to play. “We are not out of it yet,” said the Holwell manager. “Anything can happen, but picking up seven points from three games gives us great momentum for the run-in and the boys are feeling good. The home side abandoned their usual cautious start and were out of the traps quickly, settling any nerves with an opening goal inside four minutes. With the Harrowby back four struggling to settle all afternoon, Mo Matangi ran on to a flick over the defence to beat the keeper. Matangi was inches away from doubling the lead moments later when his lob was clawed narrowly over the bar. Ben Betteridge clipped the bar with a 35-yard free-kick as the chances continued to come, and the second duly arrived after 13 minutes. With the Harrowby back four cut open once more, Matt Hendey raced on to a through ball to lob the advancing keeper. The home fans were celebrating a third after just 35 minutes when Ian Bitmead was given acres of space at the back post from a Hendey corner to half-volley home. As well as keeping Harewood off the scoresheet, centre-half Bitmead had time to grab a second goal after the break. Once more he was given the freedom of the six-yard box to head in Ben Betteridge’s corner midway through the second half. And four became five when Matangi pounced at the far post to convert Matt Hendey’s cross for his second goal. But with the Holwell players enjoying the rare luxury of a game well and truly won with 20 minutes still remaining, Harrowby took advantage of a casual spell, Harewood winning the ball back and laying on a tap-in for Tom Figura. Yet, fittingly, the final word went to the home side. With Miller freshening up his side with a few changes, sub Aaron Dada made a swift impact when he beat three players before crashing a shot into the top corner. “It was nice to see an ex Premier League footballer supporting UCL football,” added Miller of Harewood’s appearance. “That’s really important. He still has passion for football. “He tried to do some coaching on the pitch was nice to see, and tried to filter down some information to the defence which was all over the place. “Ian has played with Julian Joachim and now against Marlon Harewood. I don’t remember him losing any headers, from anyone, all afternoon and he (Harewood) didn’t get any change out of Ian at all. “Our transition from defence to attack was superb, and I thought our midfield three of Luke Peberdy, Mike Hendey and Josh Clarke were superb, so there were lots of positives to take. Holwell entertain more top-10 opponents on Saturday when Northampton Sileby Rangers visit Welby Road for a 3pm kick-off.